NATIVE EXTRACTS' innovation in CELLULAR EXTRACTION uses Biomimicry to deliver the first 'True to Nature' Native Frangipani extract, delivering its full plant profile of water-soluble phyto-actives, as they exist in nature – potent, active, synergistic and bioavailable. 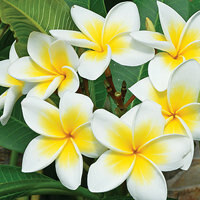 Cellular Extracts are naturally multifunctional, and the Native Frangipani offers an abundance of phyto-actives beneficial to hydrating and rejuvenating skin and hair as well as creating structure and tone. The unique synergy between it's compounds delivers a powerful natural ingredient targeting – Advanced natural hair care, anti-aging skin care, skin repair, fine lines and wrinkles, and collagen support. This stunning rainforest tree is native to Queensland and NSW and offers beautiful imagery with it's clusters of creamy yellow flowers as well as exceptional phyto-activity. Phenolic Acid : Chlorogenic Acid, Flavone Glycoside, Phenolic Acid, Sesquiterpene-Diterpene and Courmarin-Chalone are peaks independently identified and verified by Plant Sciences Analytical Services, Southern Cross University New South Wales, Australia.